Whether you have to leave your dog home alone for a few hours or just need to distract him while you tackle some chores, there are a number of clever and fun dog toys that will keep your pup busy. Some dogs may be easily entertained by a ball, but others need more of a challenge to keep them going. 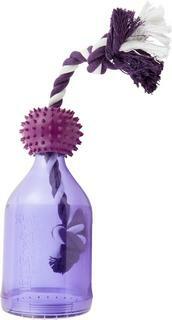 Check out these dog toys that are great for those that enjoy extra mental stimulation. 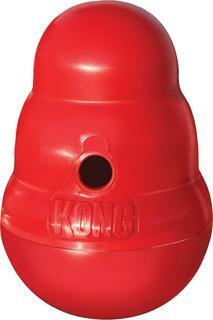 Even if you’ve never had a dog, you’ve probably heard of the Kong. This sturdy rubber cone-shaped toy comes in many different sizes (XS-XXL) to choose the best fit for your dog. It features a hollow center in which you can wedge treats, cheese, a smear of peanut butter, or whatever your creative mind can come up with. Some pet parents like to freeze contents into a Kong to make it last even longer. This puzzle toy consists of a translucent rubber ball with an internal maze. Drop treats through the hole in the ball so they get stuck in the maze. Your dog will have to roll the ball around to release the treats, providing entertainment, mental stimulation, and a tasty reward. Because the outer shell is see-through, your dog can see, hear, and smell the treats waiting inside. 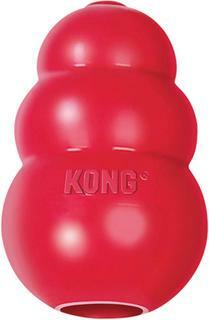 Another great puzzle toy is the Kong Wobbler which holds treats or dry dog food. It’s bottom-heavy so your dog can’t completely tip it over, but he can enjoy a fun challenge as he knocks it around in attempts to release the treats. 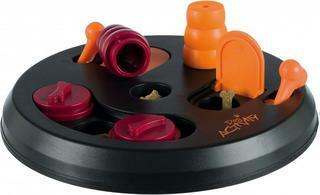 This toy is also great for fast eaters—fill the Wobbler with your dog’s food so he has to work for it. The Wobbler comes in small and large sizes. The Tug-A-Jug comes in three sizes and consists of a plastic bottle shape with a textured neck and a rope stuck halfway inside the bottle. The base of the bottle removes so you can fill it with treats or food. To release the treats, your dog can either pick up the bottle by the neck and toss or drop it, roll the bottle along the floor, or tug on the rope to shake the treats free. 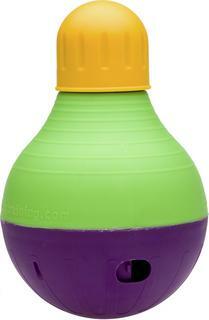 Similar to the Kong Wubba, the Bob-A-Lot has a weighted bottom and a compartment to fill with treats or food. There are two adjustable doors: one inside the toy and another at the bottom opening so you can adjust the difficulty or control how many pieces pass through when using tiny treats or kibbles. This product comes in two sizes: small and large. It may not be a good fit for tough chewers. 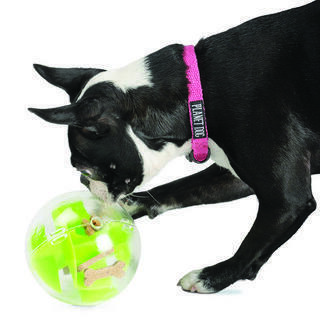 Powered either with an AC adapter or C batteries, the iFetch can provide hours of entertainment for a dog that enjoys retrieving. 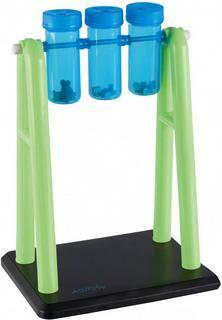 Your dog drops a ball in the top and the Ball Launcher shoots the ball out for your dog to chase. 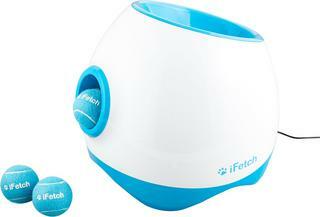 This machine comes in two sizes to fit either a standard tennis ball or the miniature size. Adjustable settings allow you to toggle the launch distance, so you can accommodate the size of your yard or indoor space. Fill the suspended beakers with dog treats to present your dog with the challenge of figuring out how to tip them over. Once he has mastered the task, you can cover the beakers with the included patterned lids for an added challenge. You can periodically rearrange the lids to keep your dog guessing. This toy measures just under 13 inches high, so it’s best suited for small and medium sized breeds. Present multiple challenges to your dog all in one toy: this puzzle toy features several compartments in which to hide treats, each one with a different task required to reveal the reward. This toy is meant for dogs that enjoy mental stimulation and may not be suitable for tough chewers. It has non-slip rubber feet and is dishwasher safe.